QUESTION: Who would you add to the list of The Greatest Haitian Leaders in History? 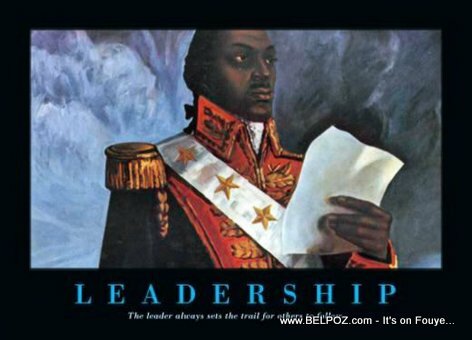 --- Often, whenever Haitians are discussing the topic of leadership, they will go all the way back to the Haitian Revolution to pull names like Toussaint Louverture, Jean-Jacques Dessalines and Henri Christophe... That was the Revolution... WHO else would you like to add to that list of "Greatest Haitian Leaders" and in WHAT aspect of Haitian society would you list their greatest accomplishments other than in politics? Also read: Are you a leader? Do you know any? Tell me... Besides some of the names of Great leaders in Haitian History who have been dead for a very long time, WHO do you know that is STILL ALIVE and deserves to be addes to the list of The Greatest Haitian Leaders in History? ACCOMPLISHMENTS - What has that Haitian person accomplished that makes him/her such a great leader? Yes, I am putting you to the test... But I am not only testing your knowledge. I actually want to know!!! Pere Johnny aka Avenel Cesaire. A general for the Haitians in south Florida. If Haïti had very good leadership who care about black people like that why we are so poor and miserable like that? Look at the sellers on the ground, look at their houses! No one to help them, If you are good in Good's eyes you will be so important in front of the nation and you will make a deference, your family will be blessed, because of your good example the nation will follow you, even thou your enemies will believe you are blessed from God and they will testify like Satan and the bad angels do, no search thing in government, only from God's people, if you talk about the bible you will find Kings or Queen like God have done to Moses, Joshua, Samuel, King David, Salomon, Queen Ester, Elijah in front of Jezabel, Joseph the Prime minister after a couple years in jail in the Phaaron's Palais, Enock, Paul Apostle, Jeremahia etc. The fact you need to ask speaks volumes. Haiti has not had great leaders politically or in-the-spotlight since the revolution.